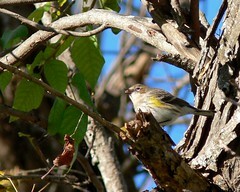 The monthly NASWC bird walk this morning was unexpectedly gratifying. It was a bad morning for birding. The cold and drizzly weather made the birds less active and hard to find. The misting rain in the air covered our glasses lenses and our binocular lenses, which made the birds hard to see once we found them. And only 30 minutes outside I felt chilled to the bone. Despite all this I was so impressed that 8 hardy birders showed up at 8:00 AM for the walk, and they happily endured an hour and a half of slow, cold, wet birding. We found 27 species of birds and here are some highlights. In the Braes Valley parking lot we saw 3 American Goldfinches, one of the first good looks at this species I've gotten this season. Near the end of Holbrook Street we found 3 Northern Flickers eating poison ivy berries in a nearby tree. Where the trail goes through the T&C playing fields we watched the creek for awhile and found Least Sandpipers, an American Pipit, a Great Egret, a Snowy Egret, and a flock of Cedar Waxwings. Nearby we found 4 Wilson's Snipe in the creek bed. This winter-resident species often goes undetected because they are so well-hidden. I have not seen very many of these birds this season. On our way back near the parking lot we found 2 Song Sparrows and 2 Field Sparrows.